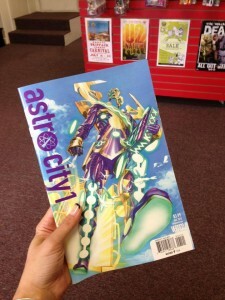 What we’re reading this morning: Kurt Busiek and Brent Anderson‘s Astro City #1 — which finally found a new home at Vertigo. Featuring new and old characters, this book is a great opportunity to jump into the series. The narration and humor makes this a fresh and fun read. In addition to adults, we think teens/young adults will also particularly like this one. Stop in for your copy! Picks & Reviews comic books. permalink.